It was a hot and dry July when two major hurricanes unleashed back-to-back reigns of fury over the Southeast. Stranded by floodwaters, people in Western North Carolina watched in horror as family members, farm animals, homes and bridges disappeared into the gushing waters of the Catawba River. A century later, the Great Flood of 1916 remains as one of the worst natural disasters in North Carolina history. More than 80 people died and the damage to homes, businesses, roads and railways totaled what would be about $480 million today. It took years to rebuild what the river destroyed. But innovation sprung from the devastation. James B. 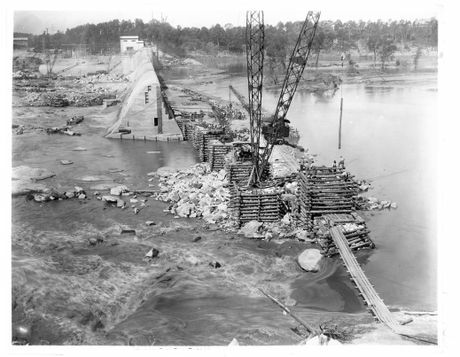 “Buck” Duke – head of Duke Energy predecessor company Southern Power – and his team devised a sophisticated engineering feat – a series of reservoirs and dams – that gave greater protection to the Catawba River and its people, and transformed the region. Today, the Catawba River remains Duke Energy’s primary source of hydroelectricity. The systems those engineers devised also created a series of lakes that sparked tremendous residential, business and recreation growth. Residents and visitors of the popular lakes might not realize it, but the historic flood was a catalyst for the lifestyles and amenities many enjoy today. It had been one of the hottest and driest summers in recent history when it started raining in Western North Carolina on the morning of July 10, 1916. A hurricane with 107 mph winds traveled inland over the Gulf Coast and through Alabama and Eastern Tennessee before settling along the crest of the Blue Ridge Mountains. For three days, torrential rains poured over the region, flooding the Catawba and saturating the land. The storm subsided and the rain ended, only to start again after a second hurricane moved inland from the Atlantic Coast on July 14, passed over Charleston, S.C., and pelted the mountains and foothills of Western North Carolina. Within the next 24 hours, the storm dumped more than 19 inches of rain over the Catawba Valley. Nearly all of it became runoff, racing down steep mountains and turning already flooded streams into deadly, raging torrents. The river rose 47 feet above flood level. People fled to higher ground and climbed trees to escape. Some didn’t make it and drowned after being swept up by the river. Farmers watched helplessly as their livestock disappeared. Thriving mills – an economy lifeblood – collapsed into the water. Machines and cotton bales followed. The storm destroyed all but one bridge along the river. By July 16, when the rain stopped, almost every dam in Western North Carolina had burst. At the time, it was the largest recorded rainfall in U.S. history. 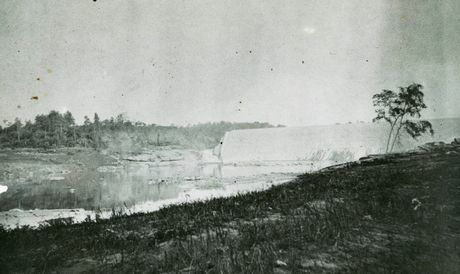 The Catawba was Southern Power’s main source of hydro power. The floods destroyed one station and severely damaged others. Rocky Creek hydro station – more than 100 miles downstream in Chester County, S.C. – suffered the greatest damage. Debris washed onto the roof of the powerhouse, collapsing it and allowing the river to sweep through the station. Great Falls hydro station – the first in Duke’s system – was out of service from July 16 to July 26. It took nearly two months to get all the stations functioning again. So the company bought electricity from Georgia Power Company to supplement the existing working plants that summer. Duke assigned engineer Charles Burkholder to oversee plans to restore the generating plants and engineer William States Lee to head the teams repairing the dams. They wanted to protect the Catawba system and residents from ever experiencing such widespread damage again. So they devised a strategy that would tame the river by engineering it into a series of lakes. They created stronger new dams and built new hydro stations. Today, Duke Energy operates 13 hydro power stations on 11 lakes. The system brought additional power to the company, drinking water for the region’s growing population and recreational spots for boating, fishing and swimming. The impounding reservoir at the Bridgewater plant, now known as Lake James, honors James B. Duke. The Mount Holly, N.C., Historical Society’s Flood Fest is July 16, 10 a.m.-4 p.m. to mark the anniversary of the Great Flood. Exhibit unveiling is at 10 a.m. Also, food trucks, music and a kids’ zone. Lakestreet Drive Band will perform at 1 p.m.